Outside Ebbsfleet station, distinctly lacking in pavements: "there was no way I was crossing the busy main road with no crossings *twice* more, so I was sticking on the unpavemented side, where the station entrance also was"
Did you get a bit excited when Eurostar started stopping at Ebbsfleet instead of Ashford? Do you live, perhaps, in south east London? Did you start to wonder if it'd be easier to get off there instead of trekking back through zone 1 from St Pancras? Maybe you spotted that nothing else is running from Ebbsfleet until Southeastern start their high speed service in December (and even that just goes straight to central London). 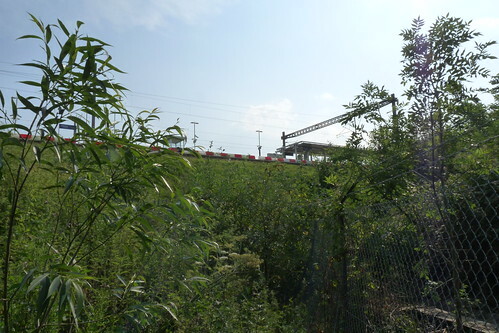 Perhaps you thought; never mind, Northfleet's only 400m away. I'll just go there. Paul, from the Bexcentric blog (who'll be on the plinth 12-1pm on 18 August! ), had the same thought when he went to try out the high speed preview service. Rather than pay £1.60 for the hopper bus from Dartford or Greenhithe (hardly a glamorous way to bookend a trip to Paris) he decided to walk from Northfleet. He even mapped the distance as the crow flies, and the walking route. But he came up against dead ends, overgrown alleyways and disappearing pavements. Luckily for us, he photographed his journey and uploaded it to Flickr. Ebbsfleet has clearly been built for cars (with the addition of those buses which, from our experiences of going to Bluewater, are nasty with a confusing ticketing system), which delivers a little kick in the ribs to Eurostar's green claims. Would it really be so hard to build a decent walkway between the two stations? 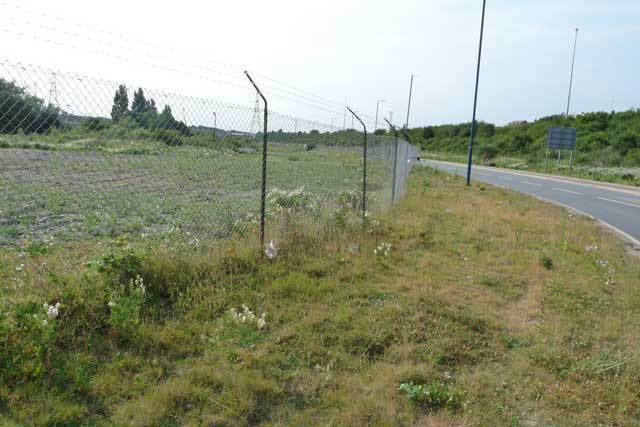 Or even pave the entrance directly outside Ebbsfleet? Put some crossings in? Hmm? HMM? A few more photos after the jump, or go straight Paul's Flickr set and commentary. 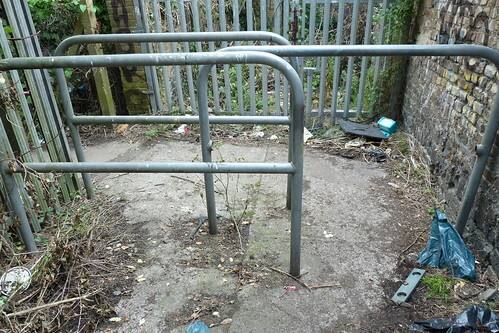 How is anyone supposed to squeeze past these end-of-alleyway barriers? More to the point, why should anyone have to walk down an alleyway to walk to a station in the first place?